The island state of Tasmania has just 1,400 hectares of vineyard producing some 0.5% of Australia’s total crush. But its repute as the country’s leading producer of cool climate, high quality still and sparkling wines far exceeds its volumetric contribution. Indeed average prices for a tonne of prime Tassie fruit are more than six times that of mainland fruit. All the vineyards are in the eastern half of the island. The west coast is the first land sighted by the prevailing westerly winds across the Southern Ocean, which means rainfall on the west coast is up to 2.4 metres, making it one of the wettest places in the world. Indeed Tasmania has nearly 14% of Australia’s total water resource, but even within the state it is unevenly distributed. By the time the prevailing winds reach the east coast, around 250 km distant, most of the moisture has been dumped, with average rainfall reaching just 600mm. Hobart in the south east has about 600mm, making it Australia’s second-driest state capital city, getting about half as much rain as Sydney. As this is on the low side, viticulture has benefited from irrigation projects, such as the Craigbourne Dam on the Coal River Valley which was constructed in 1986. Prior to this the Coal River was ephemeral, especially during the summer months, so evening out the supply of water has been essential for agricultural development. 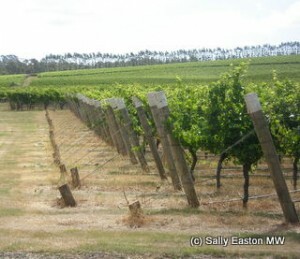 Of the climatic measurements commonly used, most of Tasmania’s vineyards have MJTs (mean January temperatures) of 16°C. Growing degree days (GDD) vary a little, from 800 in the Huon Valley, to 1180 in the Coal River Valley. This compares with Champagne’s GDD of 1000, and Marlborough, which is on the same latitude as northern Tasmania, 1150. Dr. Andrew Pirie’s revised GST (growing season temperature) measurements put parts of southern Tasmania in ‘very cool’ (13-14°C), and northern Tasmania in ‘cool’ (14-16°C) zones. Champagne is ‘cool’, while East Sussex in the UK, another burgeoning (on a micro-scale) sparkling wine zone, is ‘very cool’. It is no surprise then, that cool climate cultivars dominate the Tasmanian vineyard landscape. Pinot noir and chardonnay account for two-thirds of the vineyard area, pinot noir with 42% and chardonnay with 24%. Then comes sauvignon blanc, riesling and pinot gris, with just a sprinkling of Bordeaux varieties, very specifically sited on the warmest spots. With a true cool climate, and a preponderance of pinot noir and chardonnay, it is also little surprise that sparkling wine is king in Tasmania. Some 40% of the total crush goes into sparkling wine. Even so, Tasmanian sparkling wine to Australia is even more niche than Champagne is to France. Tasmania has less than 1% of Australia’s total vineyard area, whereas the Champagne region accounts for more than 4% of France’s total vineyard area. Yet such is the interest in Tasmania’s cool climate, the island has, since 2008, an outpost of the AWRI, which was hitherto ensconced solely in South Australia. Research focuses on Tassie specialties pinot noir and sparkling wine. Tasmania is a single geographical indication, though a number of different growing regions have been identified. See an article on regionality in Tasmania to be posted here later. The more than 200 vineyards scattered across the regions means, on average, viticulture is small-scale. Sheralee Davies, the chief executive officer of Wine Tasmania said of the “160 labels in Tasmania, 120 of them are fewer than 10 tonnes [750 9-litre cases]”. This partly explains why the Tasmanian industry has grown up on both selling fruit to the mainland for still and sparkling wines, and contract winemaking. Domaine Chandon have a Tasmanian Cuvée. Fruit that goes into both Hardy’s Eileen Chardonnay, and Penfold’s Yattarna is sourced from Tasmania. Over the last quarter of a century Andrew Hood of Hood Wines, which was bought by Frogmore Creek in 2003, and Julian Alcorso of Winemaking Tasmania have nurtured growers through the growing pains of small scale viticulture. 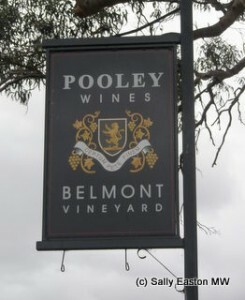 When the Pooley family set up Pooley Vineyards in 1985, they measured the size of their vineyard in rows, not hectares or acres – ‘ten rows of riesling and seven rows of pinot noir’. John Pooley said they were Andrew Hood’s first client, and Pooley’s son Matthew worked with Hood for 17 years. More recently, some growers are beginning to wean themselves off the services of professional winemaking companies, and taking the plunge themselves. Producers such as Fran Austin and her husband Shane Holloway of Delamere Vineyards, and Bec and Tim Duffy of Holm Oak Vineyard have recently put in their own wineries. Tasmanian Estates, renamed such when bought by Brown Brothers in latter part of 2010, includes Tamar Ridge, Devil’s Corner, Coombend, Pirie (sparkling only); Pirie South (still)). 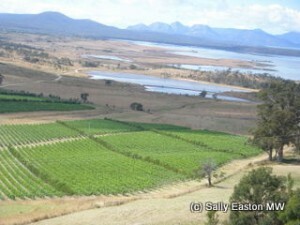 Have 30% (405ha) of Tassie vineyard area. Pipers Brook: Sparkling brands Ninth Island, Pipers, Kreglinger. Still brands Pipers Brook, Pipers Vineyard, Ninth Island. Frogmore Creek: includes Roslyn Estate, Meadowbank. My research visit to Australia in February 2012 was sponsored by Wine Australia and Wine Tasmania.